Our darling bride, Megan, who now wears the title of wife + will forever hold the title of a dear friend in our lives. She married Mr. Jenkins in the sweetest ceremony filled with handwritten nuptials + the happiest of tears. And they celebrated their new union at the home of her parents, who have raised three incredible women, two of which we have had the honor of dressing for their most special day. As you can see from the letter below + the images that tell their story below, Megan has a heart of gold + the most sincere, thoughtful way of expressing it to others. But what you will also see towards the end is just how fun this beautiful couple is!! 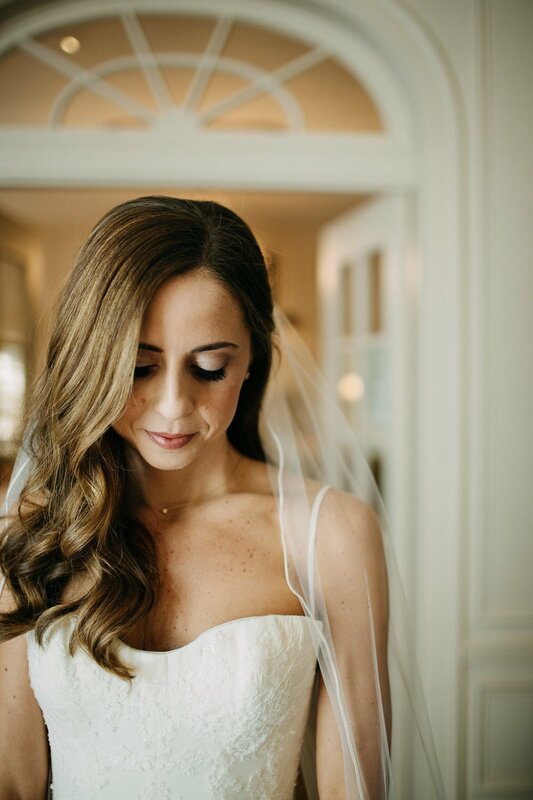 Take a look at Megan's special day + all that she so graciously shared about her journey becoming a wife. Where do I begin? I cannot believe it has been one year since my journey began with Maggie Louise. Since the day I walked in your doors leading up to my wedding day, your team has been right there with me. Your thoughtful emails, handwritten letters and regular check ins meant more to me than you will ever know. Picking a wedding dress is no easy task, but you both gave me the confidence and reassurance to know that I found 'the one'. I never once thought twice about or questioned my decision...which gave me such peace! I have enclosed a few photos from October 28th that I have been ITCHING to share with you. Walking down the aisle with my Dad towards Will was truly the happiest moment of my life. Seeing the look (and tears) on his face when the chapel doors opened was something I envisioned since the day I met him and will hold so close to my heart forever. As I stood at the altar I couldn't help to look around at all the family and friends surrounding us with their love and support with such a full heart... and I thought of you! With three other Maggie Louise Brides standing with me and understanding the meaning/ experience behind the dress I wore made the experience even more special. The ML impression is a lasting one and I thank you for letting me experience it! Wishing you all the best this holiday season and I know our paths will cross again! Megan + her sister Ashley, who was also a Maggie Louise bride. Both of these beautiful women wore a Rita Vinieris wedding gown down the aisle. 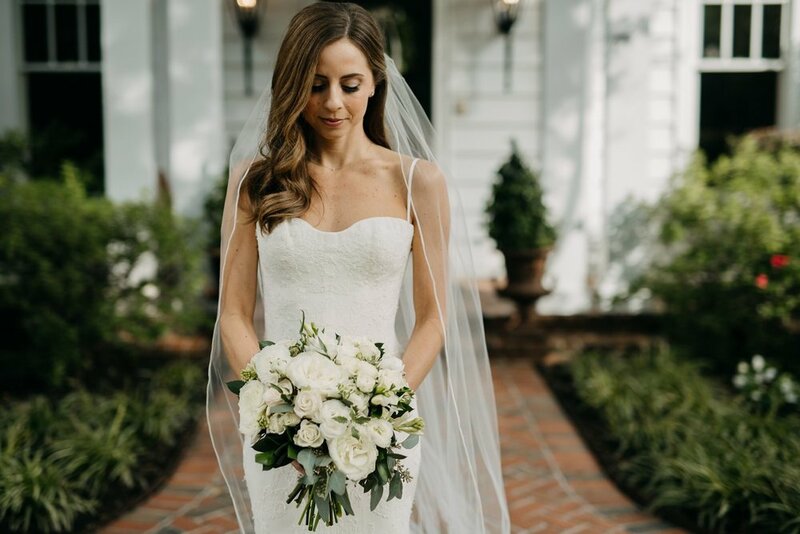 We love how different their looks were, but both of their choices embodied who they are + both chose a timeless bridal look that will stand the test of time. THE PROPOSAL : Will proposed to me one normal Saturday afternoon at home when i least suspected it. it was such a sweet, simple surprise I will always smile looking back on. TELL US ABOUT YOUR WEDDING VENUES : Given we both were born and raised in Tennessee, we knew we wanted the special weekend to be close to home. We chose to be married in the church where I was both baptized and confirmed, Christ United Methodist . The reception took place in the front yard of my childhood home where my parents still live... But there was one big problem- a large tree that sat in the center of where we envisioned the tent. Will was tasked with taking a chainsaw out a few months prior to October 28th to chop it down. It made the day that much more special...and was pretty funny to watch. TELL US ABOUT YOUR FIRST LOOK? Will and I decided from the beginning we would not have a 'first look'. Although it had us pressed for time and sunlight, this was actually my favorite decision made in the process. We both loved the added excitement and emotion that came along with our first look being as the church doors opened. I honestly didn't see one other person than Will in the church as my Dad walked me down. I was so excited to see him. WHAT WOULD YOU TELL SOMEONE IN THE PLANNING PROCESS : Take chances in your planning, do something weird and outside of the box! As long as you stay true to your style and personality you will be so happy you went with that off the wall idea you once thought you could never pull off! BEST ADVICE YOU RECEIVED WHILE PLANNING YOUR BIG DAY? Write your thank you notes immediately. MOST MEMORABLE MOMENT : I can't chose just one! The most meaningful part of our wedding, to me, was exchanging the vows we wrote to one another. We have them printed off at home as a reminder to chose one another every day. 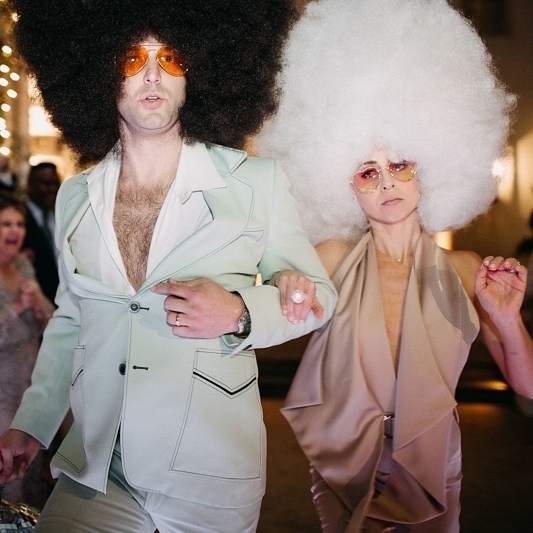 The most fun and hilarious part was surprising our guests with a late night disco starting with a costume change of me and Will and a soul train entrance to hang the disco/ get the party started. Another unforgettable part was the surprise gospel choir who snuck in the back of the church as we exited. If you can't tell...I love surprises. CONGRATULATIONS on your happy ever after, Mr. + Mrs. Jenkins! !